This article is an abbreviated version of a longer ­essay written in June 2015. The full version can be provided on request. As Russia shows signs of returning to Blue Water operations and resuming Power Projection away from the Coast, Naval strategists must learn the lessons from Crimea − Russia is unpredictable and misreading Russian capability, intent and action is dangerous – while devising future Anti-Sub­marine Warfare (ASW) aircraft force structure. In the waning decades of the 20th century, due to a noted reduction in Russian submarine deployments into the North Atlantic and economic globalization in the post-glasnost era, a commonly accepted theory that naval conflicts between states had become less likely in today’s world began to emerge. Similarly, feeding off successes in the 2011 air campaign over Libya, conflict paradigm in the air domain had shifted away from state-to-state conflicts toward hybrid warfare with non-state actors. From this, a vision began to develop postulating that future conflicts involving the Alliance would manifest in the form of a superior NATO force encountering an adversary operating on a drastically inferior technical and military level. However, trends that cast doubt on both lines of reasoning are emerging. Assumptions that land-based conflict within the European theatre would be unlikely in part resulted in NATO’s failure in predicting Russian incursions into Ukraine and Crimea. Acknowledging this failure, NATO Secretary General Jens Stoltenberg reminded the Alliance to both re-examine assumptions and look to the future when he recently announced in a speech at the Centre for Strategic and International Studies (CSIS) that ‘NATO cannot be caught off guard by unanticipated Russian military action as they were with the recent annex­ation of Crimea.’1 Further to looking to the future and providing insight into Russia’s future naval intentions, the Russian news agency TASS proclaimed in 2013 that submarine patrols in the southern seas would resume to further realize Putin’s vision of a strong and agile military.2 With the Russian Navy continuing to rebuild its open-ocean nuclear submarine force and notably increasing its power projection away from the coast into NATO’s backyard (bombers, fighter and submarine patrols have all increased in recent years), Alliance Nations should be wary of continuing the current reduction in Maritime Patrol Aircraft (MPA) ASW capability while countering a potentially unpredictable nation. The NATO MPA force structure today has been reduced to a shell of its Cold War self. Even with the pooling of existing MPA assets, NATO may find itself challenged in the face of increasing Russian submarine patrols. As the Russian nuclear submarine force is beginning to emerge from hibernation, NATO cannot afford to continue to ignore the once dominant role of MPA in the ASW realm. At the end of the 20th century, as Russian submarine deployments were reduced due to economic downturn and other challenges, Orions of various models evolved to serve in an increasing Intelligence, Surveillance and Reconnaissance (ISR) role in nearly every global theatre of operations, especially over land in Kosovo, B-H, Iraq and Afghanistan. In the US, in the 1990s, with the retirement of the S-3 Viking from service aboard aircraft carriers, the P-3 was the only remaining long-endurance aircraft capable of tracking submarines. However, its growing ISR mission was consuming larger and larger portions of the Orion’s portfolio. Although ASW remained a core competency of all P-3 crews, ASW experience across the force began to suffer as its actual submarine on-top time fell to near zero. The US was not alone in adapting their MPA to an ISR role. Across the Alliance, with a decrease in actual ASW requirements, the MPA platform adapted to fill an expanded role in an effort to achieve the Alliance’s crisis response objectives both within and outside the European theatre of operations. Additionally, as one of the primary mission roles (ASW) was no longer executed at prior tempo levels, dramatic reductions in each nation’s MPA inventory began to manifest across the Alliance. The common perception that the deep-water submarine threat had all but disappeared coloured both defence spending and MPA employment across NATO. As MPA of almost every NATO nation had undergone mission pull into the ISR domain, the requirement for a continuous anti-submarine presence and persistent ASW capability had nearly vanished. In 2003, Germany acquired the fleet of Dutch P-3C to replace their aging Atlantiques; the Netherlands have elected not to replace their MPA capability following this sale4. On 8 September 2006, NAS Keflavik deactivated, the deployed P-3s returned to home stations in the US and the Task Group charged with overseeing Anti-Submarine Warfare (ASW) Operations in the region was disestablished. The full US P-3 squadron deployment to the Mediterranean no longer exists; rather, a small ­capability for periodic maintenance and limited operational missions (mostly maritime surveillance) remains in Sigonella, Italy, while the significant portion of the squadron’s aircraft are further deployed to ­Djibouti or other bases in the Middle East. The US P-3 permanent presence in NATO has decreased from more than 2 complete squadrons stationed in Iceland and Sigonella in the 1990s to fewer than 5 aircraft today. With the continuing ISR mission in the Middle East and the new US National Defence Strategy outlining a strategic pivot to the Pacific region, NATO’s current allocation of US P-3s is unlikely to change in the near future. In 2014, with their CP-140 Aurora fleet aging, fiscal restraints have caused Canada to detour from an aircraft replacement plan (originally to be fielded by 2020) and instead have programmed a modernization initiative to 14 current CP-140 airframes to extend their utility to 2030.5 The UK, meanwhile, has yet to produce a plan to reinstate its once world-class airborne ASW capability, which disappeared when the Nimrod MRA2 and its intended successor the MRA4, were found not to comply with airworthiness standards resulting in the cancellation of the entire Nimrod replacement program.6 Across the Alliance, the inventory of current MPA is a fraction of its prior strength. Has NATO Cut its MPA ASW Capability Too Far Already? In 2012, a Russian submarine was detected within 275nm of the US east coast, presumably observing a Carrier Strike Group training exercise.11 Although the US official statement asserted that the detection process worked ‘the way it was supposed to’ in locating this submarine,12 the US accepted risk by allowing it to approach so close without the customary tracking procedures and multinational cooperative sub­marine prosecution that were de rigueur in the late 20th century. In Nov 2014, Sweden reported detection of non-NATO submarines operating in or near its territorial waters.13 The next month, Britain found itself seeking NATO ­assistance to search for a submarine reportedly operating in Scottish waters. The recent UK incident highlights the ‘asset pooling concept’ common throughout NATO’s MPA history and fits well within NATO’s Smart Defence Concept.14 However, as fallout of this incident, the British MoD has begun internal discussions about re-establishing an organic MPA ASW capability, as this incursion served notice of a significant risk to the UK’s organic strategic deterrent force. Additionally, the incident highlighted that pooling assets for a single sustained ASW prosecution will remain a logistic and operational challenge due to both the numbers of NATO MPA deployed out of the European theatre supporting ISR missions across the globe and the significantly smaller MPA force retained today by each Alliance nation. These issues are exacerbated if the ASW scenario involves multiple submarines deployed over an extensive geographical region. Looking to the near-term future of NATO MPA, many NATO Nations are exploring methods to extend the service life of their existing Orion fleet. Additionally, the US P-3 replacement aircraft, the P-8 Poseidon Multi-Mission Aircraft (MMA), recently completed the first operational deployment to the Pacific and has already participated in a small number of NATO maritime exercises. Other nations, both within the Alliance and Partner Nations, are exploring the Poseidon to replace their ASW aircraft. Although P-8s have participated at varying levels in recent NATO ASW (and ISR) exercises, the Poseidon is not projected to make a full squadron deployment to Italy until 2018 and will likely face similar mission pull out of the European theatre as the Sigonella P-3 squadron has. Although the Bear is not expected to return to its level of submarine activity during the height of the Cold War, NATO should be wary of discounting the open-ocean capability of these new and hard-to-­detect submarine classes. With recent bomber patrols off NATO Nations increasing, coupled with observations of increasing Russian military activity across all spectrums, it is logical to project that the Russian Navy will continue to increase submarine deployments in an effort to reassert its global standing and capability to project naval power. Looking globally, India has purchased a deep-water nuclear-powered Akula to improve their ability to project naval presence. China has embarked on a long-term strategy of deploying its submarine force further from the mainland and for longer durations in a similar manner. ­Future ASW, therefore, will not be relegated solely to counter diesel submarines operating in the littorals. The Alliance must continue to explore cost effective ways to mitigate the recent reduction in MPA ASW capability in order to better respond to future expansions of deep-water submarine patrols. 1. NATO Secretary General Jens Stoltenberg, 27 May 2015. Speech to CSIS. NATO Press Release. Online at: http://www.nato.int/cps/en/natolive/index. 2. ‘Russia to send nuclear submarines to southern seas’, Anishchuk, Reuters. 1 Jun. 2013. Online at http://www.reuters.com/article/2013/06/01/us-russia-submarines-patrol-idUSBRE95007V20130601. 3. ‘Sonar technology comes to grips with a dangerous new era’, Wilson, J. R., Military and Aerospace ­Electronics, 6 Jan. 2015. 4. ‘Germany’s new sub-hunter’, Air International. Online at: http://www.p3orion.nl/gn-2.pdf. 5. ‘Canada To Seek Less Expensive Maritime Patrol Plane, Upgrade More Auroras’, David Pugliese, Defense News, 30 Mar. 2014. Online at: http://archive.defensenews.com/article/20140330/DEFREG02/303300009/Canada-Seek-Less-Expensive-Maritime-Patrol-Plane-Upgrade-More-Auroras. 6. ‘Delays and Cost Challenges Beset Airborne ASW’, Sweetman, Fabey, Mackenzie & Svitak, Aviation Week. Online at: http://web.archive.org/web/20140420073903/http://www.aviationweek.com/Article.aspx?id=/article-xml/AW_04_21_2014_p02-677128.xml&p=3. 7. ‘Putin’s “Red October”: Russia’s Deadliest New Submarine’, Franz-Stephan Gady. The Diplomat. 4 Mar. 2015. Online at: http://thediplomat.com/2015/03/putins-red-october-russias-deadliest-new-submarine/. 8. ‘Improved Russian Nuclear Attack Submarine Kazan to Deliver in 2016’, Majumdar USNI News. 29 Oct, 2014. Online at: http://news.usni.org/2014/10/29/improved-russian-nuclear-attack-submarine-kazan-deliver-2016. 9 ‘Submarine patrols up 50 percent over last year’, Nilson, Barents Observer. 14 Apr. 2015. Online at: http://barentsobserver.com/en/security/2015/04/submarine-patrols-50-percent-over-last-year-14-04. 10. ‘Mind the Gap: Strategic Risk in the UK’s Anti-Submarine Warfare Capability’, Willit, Lee. 4 Feb. 2011. Royal United Services Institute. 11. ‘Navy detects Russian Sub off US East Coast’, Mount. 6 Nov. 2014 Online at: http://security.blogs.cnn.com/2012/11/06/navy-detects-russian-sub-off-u-s-east-coast/. 12. ‘Navy detects Russian Sub off US East Coast’, Mount. 6 Nov. 2014 Online at: http://security.blogs.cnn.com/2012/11/06/navy-detects-russian-sub-off-u-s-east-coast/. 13. ‘Swedes Find Definitive Evidence of Submarines’ Online at: http://foreignpolicy.com/2014/11/15/swedes-find-definitive-evidence-of-submarine-russians-call-them-unmanly/. 14. ‘Smart Defense’, NATO topic. Online at: http://www.nato.int/cps/en/natohq/topics_84268.htm?. graduated in 1994 from Maine Maritime Academy with an Unlimited 3rd Mate’s License followed by completion of the Navy’s flight training syllabus. Commander Perkins holds a Master’s Degree in Strategic Foresight from Regent University and is a graduate of the Joint Forces Staff College. 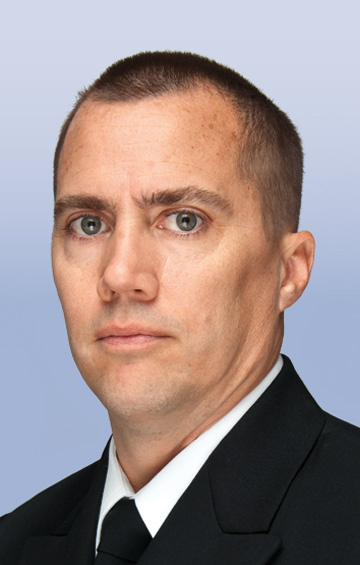 He is designated as P-3 Orion Weapons & Tactics Instructor (WTI) and on his 7 deployments he has flown combat missions in every operational theatre in which the P-3C operates. In 2012, Commander Perkins completed a successful aviation squadron command tour as Commanding Officer of Tactical Air Control Squadron ELEVEN. He recently served as Navigator of the USS George Washington aircraft carrier, homeported in Yokosuka, Japan. He is currently serving as the Maritime Air (FW) including Carrier Operations SME at the Joint Air Power Competence Centre.